Can We Build It? Only if We Have to! It’s hard to claim that Smoke and Sacrifice is derivative. 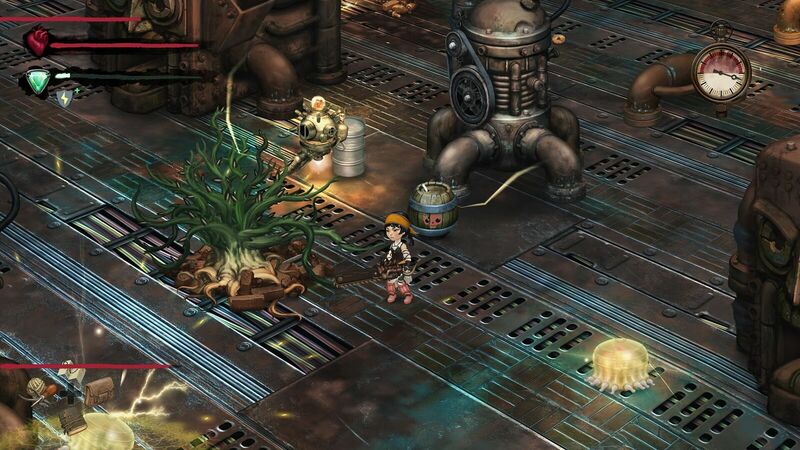 An action RPG about a mother searching for her long-lost son in a post-apocalyptic steampunk world should raise more than a few eyebrows with those looking for something different. But perhaps one should be careful what one asks for, because different is the game’s middle name, particularly once its linchpin mechanic is introduced: the constant gathering and looting of resources to assemble increasingly complex blueprints that drive the thin narrative forward. In this regard, Smoke and Sacrifice is certainly different from any other game I’ve ever played, but whether this worked out in its favor is questionable. Smoke and Sacrifice is a game in which players take on the role of Sachi, a grieving mother whose firstborn son Lio is sacrificed in the opening scene. As is the custom in Sachi’s steampunk village, each family’s firstborn son must be given to honor and sustain the Sun Tree that keeps the village safe, for dark forces and evil creatures exist in this post-apocalyptic landscape that would tear the village apart without the light from the Sun Tree. But as Sachi learns when a mysterious traveler appears in the village years later, she and the other villagers have long been deceived. Her son, along with many of the other sacrificed children, is still alive in a subterranean world filled with machines, feral beasts, and a malignant smoke that brings with it even greater evils. A game about parenthood, about the lengths a mother will go to to rescue her long-lost child, is an interesting proposition, one not yet overused by the industry. There is a lot of potential for a white-knuckle tale full of drama here. Sadly, the story itself just follows a very standard “point A to point B” track, which entails Sachi asking around for the whereabouts of her son, and each person she asks giving her the I-don’t-know-ask-so-and-so runaround. Of course, each person along Sachi’s various stops on this journey first has their own tasks for her to accomplish before they’ll point her further down the road. This leads to Smoke and Sacrifice‘s greatest flaw, its gathering and managing of constantly-decaying resources. Throughout the game’s entire twenty-hour runtime, Sachi attains a constant stream of new recipes detailing how to create weapons, armor, potions and salves, various bombs, and hearty stews, just to name a few. The ingredients necessary to produce these items need to be knocked from trees, dug up, looted from chests, won by slaying enemies, or even milked from certain beasts. Smoke and Sacrifice takes a huge gamble by placing this distinct mechanic at the core of all of its gameplay, potentially limiting its appeal to a very specific taste. Other action RPG staples, like combat and exploration, aren’t enjoyable enough in their own right to be game changers. To be fair, combat generally works as advertised — swing weapon at enemy, do damage. But there’s little finesse to this system; in fact, Sachi has a tendency to throw herself into her swings which, on an isometric field, can lead to swinging right past an enemy’s body way too often, causing successive blows to miss, slicing and dicing nothing but thin air. Other times, perhaps to make up for this, the game registers hits for simply being in the general vicinity of an enemy. Particularly with flying enemies, judging the correct space and distance for an attack to connect can be tricky. As is the case with exploration, it’s simply a means to an end, that end being to gather more items and ingredients, not to be enjoyable on its own merits. Things start out innocently enough, but the idyllic cheer won’t last much longer. Things start out simple enough, with only a handful of recipes requiring a couple of easily located ingredients. But the game quickly doubles down on this aspect of gameplay, and from this point the campaign is one long management quest. Items quickly become harder to locate, sometimes guarded by (or requiring the slaying of) tougher enemies. Some situations require the player revisit several locations scattered apart from each other to gather what they need. Before long, inventory space becomes a scarce commodity, and using a looted treasure chest as extra storage space means frequent return trips to rummage for stashes of ghost dust or chicken chunks. What’s really maddening about all of this is the constant degradation of the majority of all the collected or crafted resources. The more resources Sachi carries around with her, the more flashing red spaces on the inventory screen will warn her of something about to break or rot away. Sure, the game keeps all areas available for necessary backtracking, so more can — and often must — be harvested, but it’s no laughing matter when a late-game item requiring painstaking multi-step resource gathering disappears out of the inventory. Worse, every weapon has a limited durability; they can be fixed and even upgraded by using up — you guessed it — more resources, and even some of these have to first be created from scratch. The different zones of the game are gated off from each other by requiring Sachi to have the proper footwear to traverse it, like fur boots for the frozen snowfields, or rubber soles to survive the floors of the industrial areas, crackling with live electricity. Like her weapons and all other armor, shoes, too, have a limited lifespan, and degrade the longer they’re equipped. This means that all gear is wearing down at all times; put off restoring it for too long or run out of restorative items, and the piece of equipment breaks permanently, and must be completely recreated, leaving Sachi at best defenseless, at worst exposed to a hostile environment that will kill her in seconds. This leads to sometimes making an executive decision between completing a mission and advancing the narrative, or backtracking through a number of areas to re-gather ingredients, bringing any forward momentum to a screeching halt. If only creating items this way somehow moved the narrative forward in interesting ways, or perhaps if all of this effort provided some sort of satisfying payoff, it would have left a better taste. 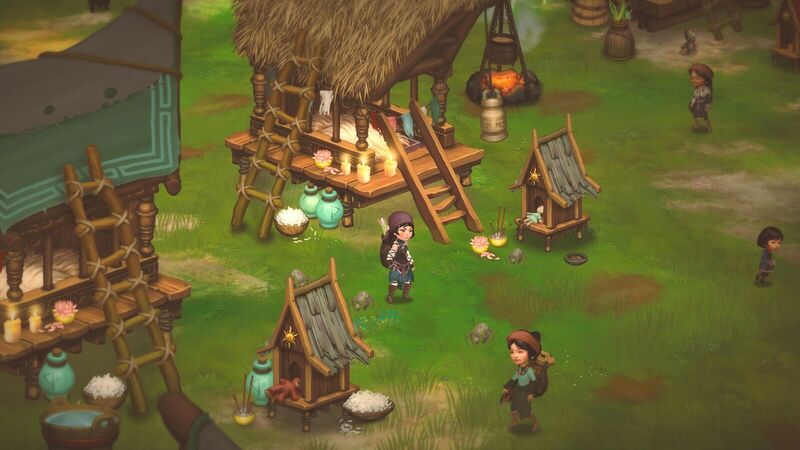 As it is, however, the whole gameplay loop quickly devolves into a cycle of receiving a quest, then locating the ingredients to make something before returning and praying for the quest-giver to point Sachi in the direction of the next roadblock. Throw in a couple of boss fights for good measure, and it was quite a relief to finally see the ending credits roll across the screen during the playable epilogue — in general not a sign of a good time. By late game, I was running past most enemies, partly because I was pining for the end, and partly because I was getting tired of having to keep fixing up my gear. Keeping Sachi alive requires paying attention to two different on-screen meters. In addition to the standard health meter, Sachi has a light meter that begins to deplete whenever she’s forced to move through the underworld’s dangerous smoke. This smoke is a by-product of the machinery that keeps the world functioning, but also addles and warps the minds of its workers, who live in it on a daily basis. Basically, it all functions as a sort of day-night cycle, each lasting about five or six minutes. With the smoke also comes ghastly new enemies that will go after Sachi. Luckily, there are lamps and other consumable items that help to keep the smoke at bay. As a storytelling device, the smoke works by giving Sachi more of a reason to want to locate Lio as quickly as possible, and save him from its ill effects. As a gameplay mechanic, it is more of a nuisance to have to deal with — facing off against powerful new enemies while Sachi’s equipment continues to deteriorate — or, of course, one can simply find a safe place and wait out the minutes until the smoke clears on its own once again. One of the strongest aspects of Smoke and Sacrifice is its graphical design. Characters, enemies, and environments are hand-drawn and full of personality. From the stylized human faces of the villagers to the underworld denizens that look like a steampunk brigade of gas-mask wearing Victorian chimneysweeps, there’s always something visually interesting going on on-screen. The one issue with the graphics is the item text within the inventory screen. Due to the large number of item slots needed, it’s quite hard to read the tiny text while using the Switch’s handheld mode, making this game a better fit to play while docked. The last part of the final boss fight also had a highly noticeable optimization issue, when the game suddenly just couldn’t keep up with the amount of on-screen objects and effects anymore, beginning to chug in earnest, and making the final boss battle a crap shoot. Music is sadly so understated that it’s barely noticeable, and really makes no impression on the player. In the absence of any voiceover, soundwork is essentially reduced to combat noises, which are, if nothing else, serviceable. I want to be able to say something more positive about Smoke and Sacrifice. I like the idea of a mother fighting to reclaim her son in a steampunk world. Graphically, the game has a very dark and moody feeling to it that sets it apart. But when a game places this much emphasis on its stressful and simply annoying gameplay hook, it’s hard to look past and see anything else. Rather than enjoy this action RPG for its fun combat or unique setting, I was rolling my eyes, actively praying that the next new recipe I completed would finally provide me with the key to move on, to find Lio, and to get me the hell out of there. With the game’s narrative failing to cash in on its dramatic tension, I just wanted to finally be freed from having to keep playing.